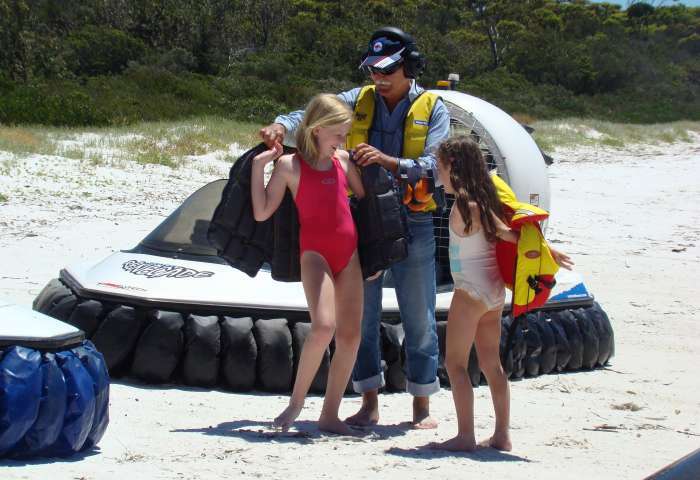 As usual there was no club meeting held during December, but the Queensland branch of The Australian Hovercraft Federation will hold a planning meeting at the offices of Silverline Insulation at 12 Veronica Street Capalaba on Tuesday, 19th January 2010. This meeting is to plan a cruise for January or February and suggestions are invited for new and interesting, but non intrusive regions to safely and harmoniously operate our small 2 to 3 seater air cushion vehicles. Cruise report - Muriel Street, Redland Bay, Saturday 5th December 2009. The last club cruise was held on Saturday 5th December 2009 from 96 Muriel Street Redland Bay courtesy of Peter and Elaine Venn. 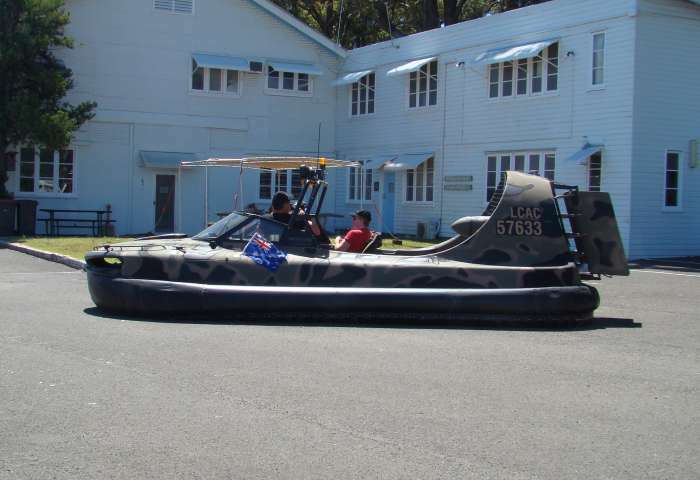 As this cruise was the last for 2009, it was also the Queensland Sporting Hovercraft Club Christmas barbecue. Peter & Elaine Venn - Turbo TP6 powered by a Subaru 1800cc thrust engine and a Honda twin cylinder vertical shaft lift engine. Des Goss - Turbo Wedge 225 powered by a Robin EC44 PM integrated lift/thrust. Steven Odgaard - Bill Baker Vehicle 2 powered by a 44hp Chaparral thrust engine and a Robin EC25 lift engine. Phillip Audsley - Our club treasurer who on this occasion was without his craft. The wind was 15 to 20 knots and so the smaller craft were not launched, however Peter had no hesitations in taking Des, Phil and Steven for a ride one at a time around several of the nearby bay islands. Each trip lasted around 20 minutes to half an hour, and Peter went in different directions each time visiting Pannikin Island, Saint Claire Island, Lagoon Island, Redbill Island and the Logan River, with the large Turbo TP6 handling the rough white cap conditions with no difficulty. After all the club members had received their adrenaline rush for the month, we relaxed in the shade and lee of the palm tree gardens in Peter and Elaine’s bayside terrace and enjoyed a nice Christmas barbecue lunch. Des and Phil headed home at around 2:00 pm. Peter’s younger brother Mark and his family joined us later in the afternoon. The NSW club participated in Camp Quality held at the Commonwealth Naval Base HMAS Creswell on Jervis Bay about 200 kilometres south of Sydney on Saturday 12th December 2009. Arthur and Judy Stead towed the Renegade down from Brisbane and teamed up with Karl and Judy Bowman (Renegade), Eugene and Robyn Zanozin (Renegade) and Peter Hardi with his Hover Flyer 580. 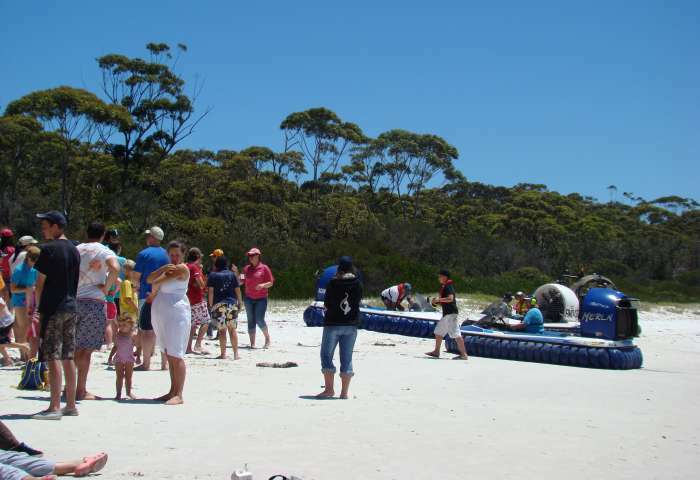 The four craft spent several hours giving many joy rides in this idyllic location to around 50 children with cancer as well as their adult carers for this annual NSW Camp Quality event. The details of the next club cruise will be decided at the January club meeting. This will be the last planning meeting for 2009.